Philadelphia [April 10, 2019]—Why would a government publish a map claiming land they do not control? Why would the citizens of a young nation—still recovering from a war for independence—care about making maps? 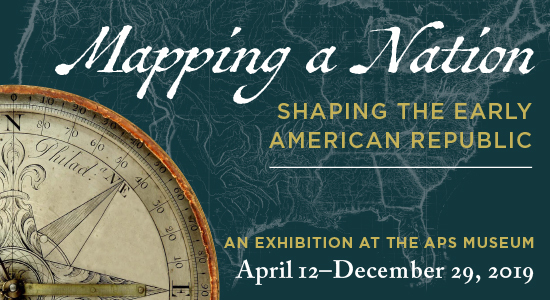 Opening April 12, 2019, the new exhibition from the American Philosophical Society Museum, Mapping a Nation: Shaping the Early American Republic, traces the creation and uses of maps from the mid-18th century through 1816 to investigate maps’ political and social meanings. The exhibition draws on the APS Museum and Library’s extensive holdings and will feature significant Early American maps, the tools that were used to create them, and historical artifacts that represent the figures who negotiated the landscape of the early United States. John Mitchell’s 1757 Map of the British and French dominions in North America—created for the English government, it claimed lands that were actually in French or Native American hands. After the American colonists declared independence, British officials used the map to negotiate new boundaries. George Washington’s 1792 copy of the plan for the city of Washington, D.C. The exhibition will be open Thursday–Sunday through December 29, 2019 in Philosophical Hall, 104 South Fifth Street, Philadelphia. Admission is free, but donations are encouraged. Groups can schedule tours by contacting museumeducation@amphilsoc.org.